The Netherlands is divided. Divided by the great rivers Meuse, Waal, Rijn, Lek, Merwede. The Dutch use the expression below the great rivers (or above the great rivers) to indicate a difference between the North and the South of the Netherlands. In the past these were religious differences: the northern regions, those above the rivers, were mostly protestant, southern provinces below the rivers mostly catholic. Religion plays a less dominant role in Dutch society these days and you don’t hear the expression that much any more. Except for during carnival. Carnaval is still celebrated mostly in the south, below the rivers. No matter how long you stay in Holland, I really recommend a visit to Maastricht. It is the capital of Limburg. Limburg is the most southern province of the Netherlands. Maastricht is split in two parts by the river Meuse and is surrounded by hills. The highest ‘mountain’ top of 322m in the Netherlands is in three-country point Vaals. Vaals, Liege (Belgium) and Aachen (Germany) are all a 30km away from Maastricht. Due to its proximity with Belgium and Germany, you see the influences in history and daily life. Food in Limburg and Maastricht is called Burgundian, Bourgondisch and the cuisine you find here is one of the best in the Netherlands. The Maastricht locals seem immensly happy and relaxed. Especially during the Maastricht Winter Carnival 2019. Whether you like carnaval or not, do not miss out on the Maastricht Winter Carnival 2019. As you might have understood from previous posts, I do love local festivals. It is the ideal way to connect with locals in a relaxed way. If you do not live or stay in Maastricht, your Dutch winter carnaval experience will start in the train to Maastricht. People, many from the Limburg province, dress in their best carnival outfits and there’s an extremely happy, relaxed atmosphere in the train. What I notice when I see the parades in the Maastricht Winter Carnival 2019 is that it’s all about having fun. Many activities are really for the whole family. Sure, there is alcohol involved and especially in the evening it can become a bit caotic, but the main activities such as the carnival parades are just good fun. There’s even a full day dedicated to kids & families. I love how Maastricht, which unlike other cities doesn’t change its name during carnaval, turns into this amazingly colorful city. The red-green decoration is everywhere and locals proudly wear their city’s colors. 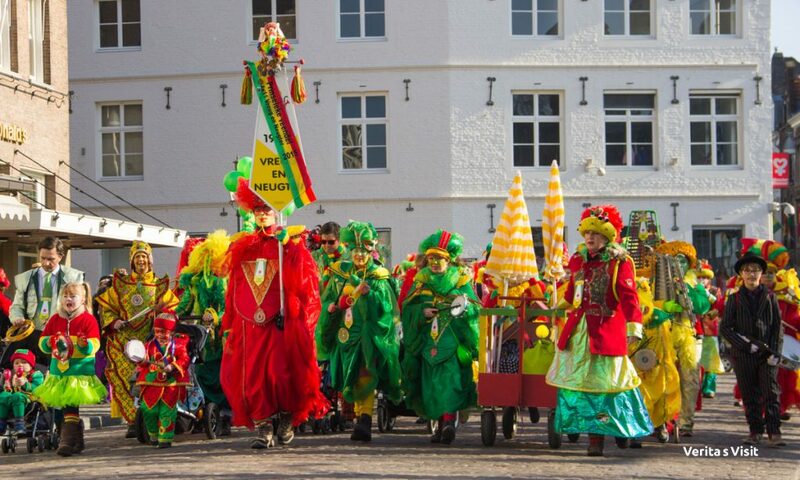 Maastricht Winter Carnival 2019 can really bring some color to the dull and grey February days in the Netherlands. No need to go down under though, going below the rivers will do! Winter Carnival in Maastricht is from 3 until 6 March 2019. Check program and activities on Visit Maastricht. Are you coming to the Maastricht Winter Carnival 2018?